I'm battling the L.A. traffic en-route to Nate Berkus and Jeremiah Brent's house (for a photo shoot that's been a year in the making). In a bid to avoid the daily monotony of being stuck bumper-to-bumper on yet another California freeway, my eyes begin to glaze over like this city's signature smoggy haze, and my idle mind sinks back to my first encounter with Berkus and Brent. I had been seated next to them at an event at the hip restaurant Ysabel two years earlier (they later explained to me it was one of their favorite places for date night), which had opened at lunch especially for them. The event was very intimate and exclusive, yet Berkus and Brent made me feel like we were old friends catching up at home after an extended break. We laughed as they cracked countless jokes and shared intimate stories while we broke bread and drank wine. I was still fairly new to L.A.
then, however, I walked away that day with a huge smile on my face, having made a couple of new friends. But this, as I soon learned, on the many occasions I've been lucky enough to be in their company, is how they treat everyone around them. You see, despite all of their success and accolades, there are zero egos with them, none of the typical celebrity fanfare, and definitely no air kisses. Berkus and Brent are as genuine as they come, with big hearts and even bigger bear hugs when you greet them. They are incredibly generous with their time and value soulful connections over frivolous small talk. Their love is truly spellbinding and it's captured all of us. It's in their enchanting L.A. home where they now raise their two children, Poppy, 3, and Oskar, 6 months, that you can really feel that love. Yes, this house has all the grandeur and architectural beauty you'd expect from the renowned celebrity designers, but it pulsates with a love and energy that I can literally feel as I walk through the front door. Their house feels like home. As I step inside their grand entryway, I see Berkus and Brent pull up outside in their sweats. They've just returned from a spin class, and as Brent walks over to greet me with a hug, he apologizes for looking so disheveled and tired (he looks anything but, of course), blaming late nights with baby Oskar and pulling an all-nighter for a client move-in nearby. "You should see this house, it's gorgeous," he beams. We all culminate in their stunning kitchen (which, I'm told, is the most-used room in the house), and suddenly Poppy dances by me with a black puppy plush toy that is the spitting image of their 12-year-old family dog, Tucker. She's in the middle of training the toy to perform tricks and throws a ball for it to fetch. Berkus breaks out into laughter, "She's given up on Tucker." As they head up the Spanish-inspired iron staircase to get ready for our portrait shots and video interview (you'll be crying with laughter and all the feels when you watch it above too), my team and I tour the beautiful house with our jaws on the floor, taking it all in, one room at a time. But it's not until we step outside that we see why the couple decided on this Spanish Colonial property built in 1928. An impressive 200-year-old oak tree literally takes our breath away (it even has its own arborist). Brent tells me it was seeing this tree that made them sign the dotted line for this house. "I could just envision our daughter climbing it, and I was sold," he says. This is actually where we take our first shot of the day, and it left the whole crew all glassy-eyed and emotional. But Berkus and Brent are in the business of emotions. Their forte is creating inspiring environments that tell the story of the people who live there. That very philosophy formed the basis of their new furniture collection for Living Spaces. "We want people to tell their own stories in the home," Berkus tells me. "We're not dictatorial in terms of what we think anyone else should be living with, but if we provide the silhouette and the shape and the option at prices that people can afford." They both wanted to give people the freedom to experiment and to explore elements of design they hadn't before. "We really encourage that," he adds. "The whole idea was an affordable luxury—creating sofas that look like Jean Michel Frank and they're like $1000." He points to the famous faux-sheepskin Liv armchair in their family room, which they both loved so much they had to bring two home. As Brent explains, it's also kid-friendly, so you can take a wet rag to it. "It's not precious," he adds. Not that either of them really believes in designing a kid-friendly home. "To me, growing up, the child-friendly home was you don't mess with things or disrespect the furniture in your home because you'll get in trouble," he muses, reflecting back on his childhood. "We both were raised to respect our homes. For us, child-friendly is upholstering things in child-friendly fabrics. Things that can withstand the wear and tear of just kids in general because they're always messy at best." Instead, they choose to involve their kids in the design and decorating process, which was how Berkus was raised. He goes on to tell me how he'd visit the antique fairs as a child with his mom, Nancy Golden, who was also an interior designer. Poppy is definitely following in Berkus's stylish footsteps. "Poppy loves to move furniture with us," he says. "The kids are involved in the story in the home, as they should be. So our hope, I mean we're three and a half years into it, but our hope is that we can continue to raise them both with respect and just an awareness to take care of the things that are in the house. I think it's a mix of teaching our kids that they need to respect and honor the things that we've worked so hard for and the things that make their environment beautiful, and at the same time being realistic about the fact that we're not going to live in a padded cell until our kids are 10 years old. No one's going to enjoy that." Even at the tender age of three-and-a-half, Poppy already has a vocabulary about design. "We took her to a project that we just completed, and there's a little girl who lives there that she's friends with," Berkus turns to Brent as he's retelling the story, and their eyes both light up at the fond memory. "Poppy came home and told everybody exactly what her friend had in her room, down to the color of the wallpaper, and it was the craziest thing. We didn't realize that she was taking it all in, because we didn't discuss it with her." Poppy is also very specific about their own house and knows if something has been moved or rearranged. "There was one little fish bench that we had in the TV room, and we kept moving it out," says Berkus. "But I would come back into the room later, and it would be back, and I would say 'Why is that bench here?' She kept bringing it back in and would tell me, 'It goes right here.' She's just aware." Seeing Berkus and Brent at home with their two young children, it's clear they are very active parents and are really involved in the kids' day-to-day. Their offices are located in the separate "coach house" at the back of their property, so they can be very hands-on, and despite insanely busy work schedules, strive for some kind of balance. It's refreshing to hear that they haven't figured out that elusive work/life balance yet either. "To be frank with you, I'm still trying to figure it out," Brent says unapologetically. "Work is intense. We have the luxury of our office in the coach house here in L.A., so I get to see the kids when they come home, but I'm still trying to figure out the balance of it all." One thing Berkus credits his husband for is setting the tone of the house. As soon as he gets up each morning, Brent gets the environment ready for the kids with candles, music, and breakfast. "It changes the energy, and the kids just feel more relaxed, you know?" Berkus says smiling. Then they both take Poppy to school in the morning and schedule their day around that. "Jeremiah's definitely middle-of-the-night daddy and early morning daddy, and I'm the more nighttime daddy like bath time and story time," Berkus explains. With so much of their day-to-day together, from the office to home, I quiz them on how they make it work and find the time to spend time together. They both express how critical date night is, but beyond that, they each believe in quality time alone. Brent loves to channel Demi Moore in his own pottery studio, which even though he hasn't done for a while he admits is "deeply therapeutic." He says, "I like to close the door, turn the music up, and light every candle known to man." He also makes time to meditate in the morning, relishing what he can discover about himself with just 30 minutes of alone time. For Berkus, it's a half hour of self-care, such as a manicure or foot massage, which he says reenergizes him. But, he says, "It's hard because I'd rather spend time with the kids or him (Brent) than alone. You walk out the door, and the nanny's giving Oskar a bottle, and that's a decision as well. Do you want to go get a foot massage, or do you want to give your son a bottle? It's never an easy call." I think we can all agree that the parenting struggle is real. There is no clear path or way to avoid the guilt when you're not with your children, but as Berkus explains to me, we can't be fully present with them if we're not fully present with ourselves. That's when Berkus turns to me and candidly admits that he's better at finding that quote-unquote alone time than his husband. "This was something that we struggled with when we first got married," he says. "I'm intrinsically much more selfish outwardly than Jeremiah. I really do believe, and I know myself well enough to know that at 47 years old, if I start feeling like I'm not taking care of myself, not eating well, I'm not working out, I'm not caring for myself, my skin or my hands or my feet or my body, I definitely am not present in a way that I want to be. That old adage of put your own oxygen mask on first really rings true for Berkus. "I believe in that," he says adamantly. "I live that. I will maintain my own sense of self first so that I can be present and contribute in the way that I know I'm capable of." This approach that you have to put yourself first also applies to their relationship and their parenting style. "Our relationship is what everything in this house is born from," he tells me. "If we're good, we're getting along, and we're open with one another and vulnerable with one another, the whole house runs beautifully." Brent agrees. "I mean, everybody I've ever spoken to has basically told me that the kids come first, and that's not our truth. It's not. It doesn't work because we are the birthplace of all of it. We are the beginning of the ripple in this house. And I feel like we're trained to think that that is a really selfish thing to say, but it's not." Then Berkus puts his hand on Brent's shoulder and says one of the most profound things I've ever heard, "We'd walk through fire for our kids, but we'd walk through it holding hands." I'm covered in goosebumps at this point. "If we're not right, the whole house feels like it's on the tilt, so we are very cognizant of that, plus this is where it all started," adds Brent. "It was about the two of us." Despite all of their celebrity clientele and status, the most surprising thing about Berkus and Brent is their straightforward and candid responses to my line of questioning. They're very open and sit in their vulnerability with a level of comfort I'm not used to seeing in anyone, let alone people of their stature. They don't hesitate to answer my personal questions about their family, parenting style, and relationship with honesty, integrity, and frankness. "We're very sensitive to each other's moods though," Berkus admits. "Jeremiah can be the barometer of the home if he's in a bad mood or upset about something, and vice versa. We both know that we both have the power to throw it and throw it for the whole day so we're sensitive to that. We really are aware of that. You have to work at that vulnerability; you've got to walk in that door vulnerable." When I ask them about how they maintain that level of vulnerability, Berkus is quick to quote one of his mentors, Maya Angelou. On Oprah years ago, an audience member asked her what she thought was the most important thing you could do as a parent. She said, "Do your eyes light up when your child enters the room?" That's something Berkus and Brent strive for. "The biggest thing we try to do the second our kids walk in the house is ask ourselves, do our faces light up? Are we excited to see them?" he tells me with fervor. "Which we do every time. We're always excited, but we make sure to stop what we're doing and say hello. So we have to remind each other to do that for one another as well. It's just so nice to feel seen as a child." Despite their similarities and sensitivities, they're both quick to admit their differences too. In fact, Berkus stresses how distinctly different they are as people, which has also helped them craft separate careers too. "We cross over when we can and when it's appropriate, whether it was the show (they host Nate and Jeremiah by Design on TLC) or the furniture collection (for Living Spaces), and that's the fun stuff," he says. "That's when you just get to get in there and enjoy each other and create together, which we love to do." 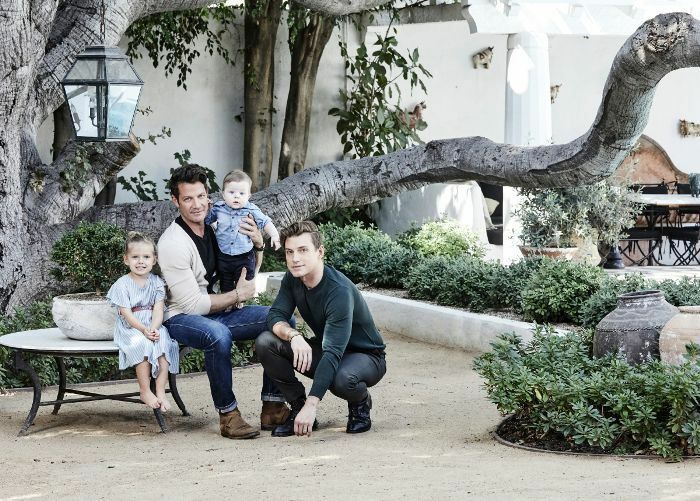 Outside of the work they do together, they also run their own self-titled interior design businesses—Nate Berkus Associates is based in Chicago, while Jeremiah Brent Design is L.A.-based—which they are quick to remark are very different in aesthetics and design style. However, they do have one thing in common. "We both have a tremendous respect for things that are made by hand," Berkus says. "When you fill a home with wood that was carved by hand and pillows that were knit or woven by hand and rugs that were loomed by hand and metal tables that were crafted by hand, even in a home of this scale, you're automatically relaxed because you can set something down on anything and everything has a patina, everything has a layer, everything feels timeworn and not precious, and that is a huge common ground between the two of us." As Brent quips, "You can't hurt anything in this house, which we think is so important." Just looking around the house, you can also quickly decipher that they're both fairly color-averse, too, erring on the side of neutrals with a hint of greige. Berkus skews darker and moodier while Brent generally skews lighter and brighter. When I raise the topic of color and elude to Berkus favoring color over Brent, he was quick to dispel my assumption. "No, I've actually always been drawn to a lack of color," he affirms. "I remember my first apartment in Chicago, I could barely afford a sofa and I had no color; it was black and white and tan and gray. So I think both of us find a common ground in that. I love color for other people." Berkus does clear up the biggest differences in their style though: that Brent is very modern, and Berkus is über-traditional. He laughs that his taste would lead him toward a weird Venetian-painted finish while Brent would be into "some sort of weird geometric stone shape, and I'm like yuck." It's the combination of their aesthetics, that modern-traditional fusion that is really where the sweet spot lives and why they have seen so much success in their television show and furniture collection. "It's also just relatable," Berkus says to me with authority. "I mean, I think that bridge between the two makes it real for people. Not everybody wants to live in an Elizabethan castle or a super-stark modern Victorian home, which, by the way, is my favorite." I nod my head in agreement and remark that most people don't want to live in a gallery, but suddenly Brent pipes up with "which I would love." Berkus laughs, "Yeah, left to your own devices you would do that. You'd be like, What do you mean? We have two little kids on this stone monolithic daybed. It's a perfect place. They can just lay down on this slab of black marble. I think that the balance is we love the same things, but we showcase them differently." Brent pauses, then adds, "Yeah, and we combine them differently. We push each other on that." We continue chatting through design styles we admire, Berkus waxes lyrical on his "mad respect" for textile designers like Lisa Fine, Carolina Irving, Penny Morrison and love of embroidery or block printing out of the old French houses. Seeing how different they both are in their work and what drives them as creatives makes me realize that opposites really do attract. "We want to create spaces that represent the people who inhabit them and the moments that they're going to have and experience within those spaces," Berkus says to me with true sincerity. "There's really some tremendous power in living in a home that rises up to greet you." Ain't that the truth. We wrap up the formal part of our interview and head into the library (which they tell me "sounds fancy, but we're not fancy") to film the video. As they settle into the black leather club chairs, I'm in awe of how familiar and comfortable they are in front of the camera. I shouldn't really be surprised because they've been on much bigger sets before this one, but it's their ease and relaxed nature around so many strangers, especially when answering my very existential questions about life, love, and hopes for their children's future, that really set this couple apart. Berkus and Brent are the real deal. They are madly in love with each other and their children. It's very humbling to be in the company of two people who truly have nothing to hide, who aren't afraid to stand in their true self and ditch their glossy identities to bare it all for the world to see. It's a breath of fresh air. As we finish up the shoot and pack our things, Berkus has swapped his celebrity designer hat for that of a doting parent as he walks in with baby Oskar, who's just woken up from a nap. The entire crew mills around the gorgeous blue-eyed boy (he's the spitting image of Berkus) oohing and ahhing and vying for his attention. It's a beautiful moment that proves when it all boils down, we're all the same, sharing this human experience together and trying to raise our children with love and compassion.